Stephanie Sigman is a Mexican-American model turned actress who first garnered attention for her breakout role as Laura Guerrero in the independent feature film Miss Bala. Named one of Variety's "10 Latinos to Watch in 2015," Sigman most recently appeared on television in the critically acclaimed series Narcos as Valeria Velez. Her additional television credits include recurring roles in the series American Crime and The Bridge. 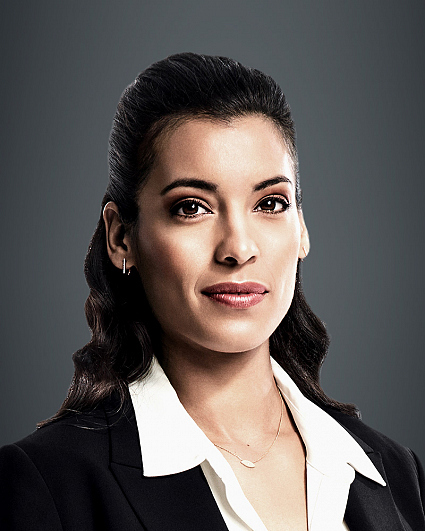 Sigman has amassed a number of feature film credits, including her landmark role as the first Mexican "Bond Girl" in the 2015 release Spectre” opposite Daniel Craig. Most recently, she starred in Shimmer Lake, opposite Ron Livingston, Rainn Wilson, Rob Corddry, and Adam Pally, and Once Upon a Time in Venice, opposite Bruce Willis, John Goodman, and Jason Mamoa. Later this year, she can be seen in the horror sequel Annabelle: Creation. Her additional film credits include the dark comedy War on Everyone, opposite Alexander Skarsgård and Michael Peña, and the Norwegian independent thriller Pioneer, opposite Wes Bentley, which premiered at the 2013 Toronto International Film Festival. Sigman is an avid dog lover and sports fan who trains in boxing during her free time. She is a huge baseball enthusiast and grew up in the industry due to her father, Lee Sigman, a former professional baseball player, team manager, and current talent scout for the New York Yankees. Born in Ciudad Obregón in the state of Sonora, Mexico, Sigman received her professional training at State Center of Artistic and Cultural Education, part of the Querétaro Institute for Culture and the Arts in Querétaro, Mexico. Currently, Sigman resides in Los Angeles with her dog Paloma. Her birthday is Feb. 28. Follow her on Twitter @sigmanstephanie and on Instagram @stephaniesigman.